England won by 15 runs. We've all calmed down now. Nothing to see here. England are up to second in the group having won two on the bounce. They've given us a batting display and a bowling display this tournament. Maybe one glorious day, they'll do both in the same match? All English eyes now turn to Friday's game between South Africa and West Indies. A win for the latter and England will just need to beat Sri Lanka to reach the last four. Just. Like it's that easy?! Before all that, though, we will be back in about 30 minutes for live text coverage of India v Bangladesh. I'll see thee soon. More from England captain Eoin Morgan: "We were outstanding in the first six overs with David Willey, Chris Jordan and Liam Plunkett. Our combination of spin didn't really come off, Afghanistan are great players of spin. It's a credit to Afghanistan the way they play, they're probably the strongest associate nation at the moment." Afghanistan captain Asghar Stanikzai: "England took 25 runs off one over, that's a big reason as to why they got to a good score. "The guys in the top order lost wickets early to poor shots. The pitch wasn't difficult and they didn't take responsibility. That's a big reason as to why we lost." 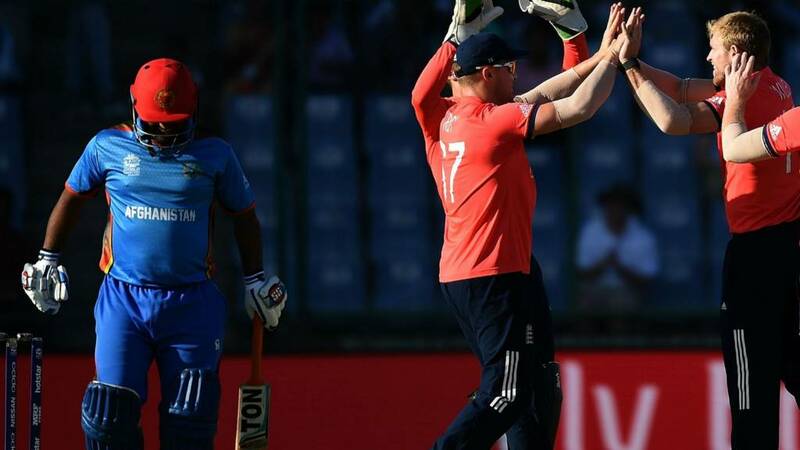 England captain Eoin Morgan: "Quite simply, we came for a win and we won. We will dissect that performance moving into Saturday's game against Sri Lanka - playing a dangerous side like Afghanistan can be a banana skin. Under-performing, you can come unstuck, and we didn't really adapt to the surface when we were batting. David Willey and Moeen Ali played really well to allow us to put a score on the board, but we fielded and bowled well." "England had the problem in the past of scrambled minds. It's worse against the Associate teams and when pace off the ball gives you time to think - thinking doesn't always help." Mark: Who do I see about having life sized Moeen Ali and David Willey statues crafted? Paul Howley: Do you think its possible that England's bowlers and batsmen might actually play well in the same game? "Afghanistan should have won that game. If there was a turning point, it was the 19th over when Moeen and Willey took 25 off the left-arm spinner. It just gave England a threatening target." England all-rounder Moeen Ali: "We wanted to give ourselves time, take it to the last three overs and have a hack at the end. "It was probably better for me to take my time and, in the end, it came off. "It helped having a left-armer bowling to two left-handers, but no matter who bowled, he had to go. "Today I bowled a little bit slower, but was a bit disappointed. It was about getting the job done against a good side. It was a tough game." Tim Stubbs: I was never in doubt. Honest. This is what England do. Now, be still my beating heart! "Crazily this victory will be on a par with the South Africa one, there were stages when they were completely gone." Bowling: Willey 4-0-23-2, Jordan 4-0-27-1, Plunkett 4-1-12-0, Moeen 2-0-17-1, Rashid 3-0-18-2, Stokes 3-0-28-1. "England don't give you an easy ride very often do they?" Sid Keyte: That 'Houdini' show will feel like a massive win. England will now go all the way to the final. Shafiqullah ends with a four but it is final flourish that does nothing to alter the result. England get themselves out of jail with a superb bowling display. And another dot. Game over. Well bowled, Stokes. Another dot. England's win is nailed on now. What a stop for Jos Buttler. Shafaq inside edges and it destined for the boundary until Buttler reaches out at full-stretch to stop. After a brief stoppage to remove a kite (yes, a kite) from the pitch, Stokes charges in and his short ball is pulled but for a dot as Shafaq decides he is better facing. Oh-o. Stokes' first ball is really poor and sliced away for four by Shafiqullah.